So you got a new AR-15, and while you may have or will soon have an optic to use on it, you definitely want to make sure the BUIS (back-up iron sights) are ready for use in case you ever need to use them. There are a few different methods to sight in iron sights for the AR-15. Some of the methods are better than others depending on what type of BUIS you have as well as how you plan to use them (application). In this blog post, we will offer one simple way to make sure an "A2" style iron sight set-up will be good to go for practical use on your AR-15. 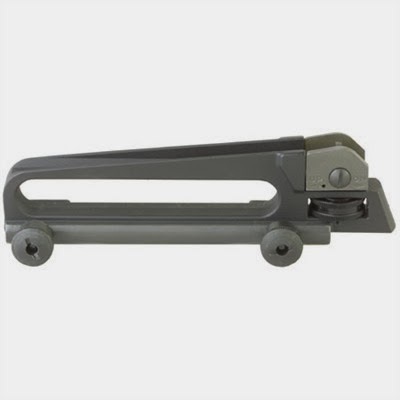 The rear sight of an A2 upper receiver or detachable carry handle is adjustable for windage and elevation. Some styles of detachable or flip up rear sight are only adjustable for windage. Most AR-15 rear sights have a "dual aperture" peep sight. There is a larger aperture for short distance (marked 0-2 for 0-200 meters), and a smaller concave aperture for longer distances. When using the short range, larger aperture, your elevation knob should be set at 8/3 for an A2 upper or 6/3 for a detachable carry handle sight on a flat top upper. When your distance is beyond 200 meters, use the smaller aperture and set the elevation knob to the correct numeral for known distance: 8/3 or 6/3 for up to 300m, 4 for 400m, and so forth...8/3 would also be used for 800m. You will notice there are positions in-between the numerals for fine tuning at distances in between the 100m settings. All rear sights have a windage knob, usually on the right (ejection port) side of the weapon. If you need to move your point of impact to the right, move the knob clockwise. If your rounds fired are hitting to the right of point of aim, move the windage knob counter-clockwise. Set your rear sight elevation knob to 8/3 or 6/3 and raise it (clockwise) one click. This is the only elevation movement you should perform with the rear sight elevation adjustments during the sight in process. All other elevation adjustments should be made with the front sight during the sight in process, and once the sights are zeroed, no further elevation adjustments should be made with the front sight (they should hereafter only be made with the rear sight). For the zeroing sight in process, make sure you are using the small (long range) aperature on the rear sight. Make sure that the rear sight aperture is in the middle of its adjustment range. 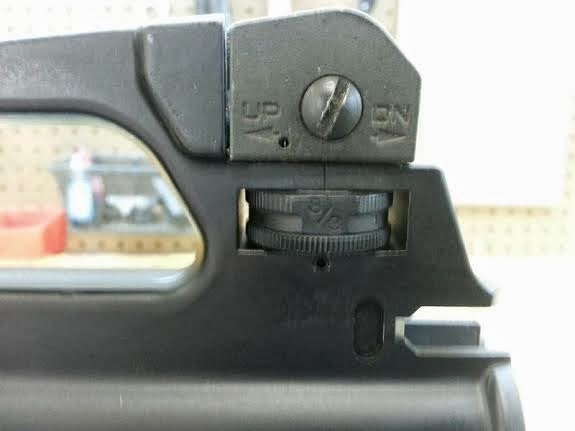 You will notice a small mark on the aperture that will correspond with a center mark on the rear sight base (this is known as a mechanical zero). Check the front sight's mechanical zero by ensuring the base of the front sight pin is fairly level with the hole for it in the front sight base. Using a 25 meter zeroing target, aim and fire at the target. It is a good idea to fire at least 3 rounds and maybe more to be sure of where the bullet is impacting and control any variables that can be a result of improper technique that can occur with just one shot fired. Take your time and use proper trigger manipulation. Try to maintain the same cheek weld and sight picture for all three shots (avoid the temptation to disrupt your sight picture to view where your initial shots have impacted). If the shots did not impact where you would like, measure the vertical and horizontal distance from the center of the "3 shot triangle" to the "bullseye". If the group of shots impacted high or low from point of aim, remember to only adjust the elevation on the front sight. Moving the front sight clockwise will lower the sight and raise your point of impact, counter-clockwise will raise it, and lower your point of impact. A front sight adjustment tool makes this a fast and easy process, but if you have something with which to depress the plunger on the muzzle side of the front sight pin, needlenose pliers can be used to change the elevation. One "click" will move the point of impact 1/8" at 25 meters (or 1" at 100 meters). If the group of shots impacted to the right or left of point of aim, move the rear sight windage knob. All rear sights have a windage knob, usually on the right (ejection port) side of the weapon. If you need to move your point of impact to the right, move the knob clockwise (the rear sight aperture will move to the right). If your rounds fired are hitting to the right of point of aim, move the windage knob counter-clockwise (the aperture will move to the left). Each "click" will move the point of impact 3/8" at 25 meters (or 1 3/8" at 100m). Once you have calculated and performed the adjustments to the front sight (elevation) and the rear sight (windage), fire another group of shots and repeat these steps until point of impact matches point of aim. When finished, move the elevation knob back to the 8/3 or 6/3 setting and flip the rear sight aperture back to the larger, short range aperture unless you will be firing at distances beyond 200 meters. There are many different methods for setting what is known as a "battlesight zero"...this is a practical method for those whose shooting application is mostly related to personal defense or duty use. The goal of this type of sight setting is to achieve acceptable battlefield hits from 25-250 meters (acceptable=target vital area hits). While it is most accurate to do this at as long of a range as possible, adjusting your sights so that point of impact is 2.4 centimeters or just under 1" below point of aim at 25 meters will allow you to achieve a fairly accurate battlesight zero of this type, and place effective hits at the typical distances encountered. Again, depending on your application (how you plan to use your weapon most of the time), weapon configuration, and range/distance availability, modifications to the suggested procedures in this post may be necessary; the method(s) described here are just one practical way to get your BUIS on target. Thanks for reading our blog. If you have any questions about the AR-15 rifles we manufacture or the parts we offer at www.del-ton.com, please feel free to contact us.